and to be shown at Theater Freiburg on 04.12.2010. 9./10. June 2010: The Munich production of Elfriede Jelinek’s play ‘Rechnitz’ is to be shown at the Stadsschouwbourg theatre in Amsterdam. Spring 2010: The Lycee Francais in Vienna (7. Klasse AHS) is doing a theater workshop on Jelinek’s play – to coincide with the Austrian premiere at Wiener Festwochen – including interviews with local people and a field trip to Burgenland. 07.06.2010: 3SAT – ‘Kulturzeit’: ‘Der Vergangenheit stellen: Rechnitz damals und heute’, moderiert von Ernst A Grandits. 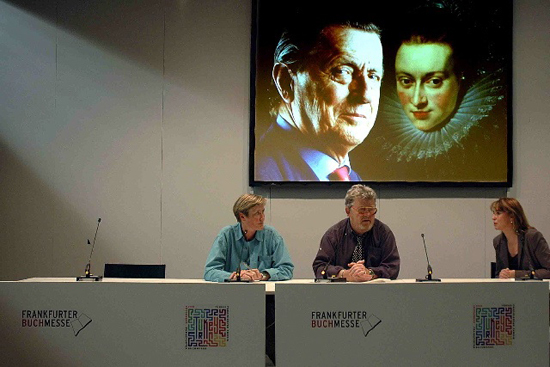 22./23./24.05.2010: The Austrian Premiere of Elfriede Jelinek’s play ‘Rechnitz (Der Würgeengel / The Exterminating Angel)’, based on ‘The Thyssen Art Macabre’, is to take place during the ‘Wiener Festwochen 2010’. DIE KOMMENTARE SIND WIRKLICH LESENSWERT. ES GEHT EINEM DER KOPF UEBER!Der Neue Merker schreibt: ‘Was soll denn das ewige Täter-Geschwätz?’ – Renate Wagner. 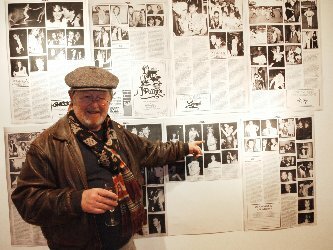 This exhibition of Nick Ashley’s photographs of the privileged many for Ritz Newspaper (Ari wrote their column), was held in January at Gerry Farrell’s Sladmore Gallery in Bruton Place, Mayfair. The next generation were fascinated to see what their parents got up to. There was much pride in the obviously most outrageous. 19.12.2009: Schauspielhaus Zurich – Swiss Premiere of Elfriede Jelinek’s play ‘Rechnitz (Der Würgeengel)’. Further performances are scheduled for 21./22.12.09 and 6./7./25.01.2010. Still playing in Zurich as of 06.06.2010. September/October 2009: ‘Rechnitz (Der Würgeengel)/(The Exterminating Angel)’ was shown in the production by Münchner Kammerspiele theatre at the Powszechy Theater in Lodz (Poland) on 12 and 13 September 2009 and at the Thalia Theatre in Budapest (Hungary) on 17 October (supported by the Goethe Institute). http://www.dilia.cz/view.php?cisloclanku=2009072302Following a poll carried out yearly by the specialist newspaper ‘Theater Heute’, Jelinek’s play has been voted ‘German-speaking play of the year 2009’ and Münchner Kammerspiele ‘Theater of the year 2009’. 14.06.2009: Elfriede Jelinek accepts the Mülheim Dramatists Prize which she won on 3 June for her play, ‘Rechnitz (Der Würgeengel)’, based on ‘The Thyssen Art Macabre’, published in Germany by assoVerlag (Oberhausen) under the title ‘Die Thyssen-Dynastie. Die Wahrheit hinter dem Mythos’, after it was performed by Münchner Kammerspiele at the Mülheimer Stücketage Theaterfestival in Mülheim/Ruhr, Germany on 21 May. 05.05.2009: Elfriede-Jelinek-Research-Centre at the University of Vienna, Austria. 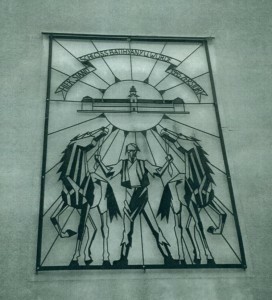 RE.f.u.g.i.u.s and the Institute for Theater, Film and Media Sciences of Vienna University. ‘Ich möchte zum Ausdruck bringen, wie sehr es mich befriedigt, dass ich so eine wichtige Rolle dabei gespielt habe, Francesca Thyssen dazu zu bringen, als Teil ihrer pekuniären Erbschaft auch einen Anteil an der Verantwortung für das Verhalten ihrer Familie zu übernehmen. Meiner Ansicht nach spiegelt sich dies dadurch wider, dass sie diese Veranstaltungsreihe finanziell unterstützt.Es wäre mir jedoch sehr viel lieber gewesen, wenn sie statt einer Unterstützung in Geldform ein Eingeständnis und eine Entschuldigung geäussert hätte, denn da die Thyssens die Sponsoren des Rechnitzer Schlosses und der Gräfin waren (und ich habe dokumentarische Belege hierfür heute dabei), sehe ich etwas obszön Ironisches darin, dass wir hier 64 Jahre später sitzen und über das Massaker von Rechnitz sprechen, bzw. über ein Theaterstück von Elfriede Jelinek, welches das Massaker mit einschliesst, während wir wiederum von den Thyssens gesponsort werden, diesmal über Francesca’s Kunststiftung.Weiterhin sehe ich mich genötigt zu hinterfragen, wie die Universität Wien ihr Geld annehmen und dennoch Unparteilichkeit in Anspruch nehmen kann, solange noch Zweifel am Ausmass der Thyssenschen Verstrickung in das Massaker von Rechnitz geäussert wird.Leider ist dieser Interessenkonflikt nicht einzigartig in der akademischen Welt, er existiert auch im Falle von Wolfgang Benz, Leiter des Instituts für Anti-Semitismus-Forschung an der TU Berlin und bei Richard Evans, Vorsitzender des Fachbereichs Geschichte an der Universität von Cambridge, die beide versucht haben, meine Ausführungen in der Frankfurter Allgemeine Zeitung und in meinem Buch, ‘The Thyssen Art Macabre’, erschienen in deutscher Sprache unter dem Titel ‘Die Thyssen-Dynastie’, zu diskreditieren, während sie gleichzeitig Finanzierung von der Fritz Thyssen Stiftung annahmen.Es ist traurig, denn meiner Ansicht nach stellt diese Art von Uebereinkunft die Glaubwürdigkeit von akademischen Historikern grundsätzlich in Frage.Nun habe ich noch eine andere Frage. Wenn Gräfin Batthyany, geborene Thyssen, die Ermordung von 200 Ungarischen Juden als Abendunterhaltung finanziert und möglicherweise sogar eine aktive Rolle bei den Tötungen gespielt hat, und dann schreibt Elfriede Jelinek ein Stück, welches diese Greueltat einschliesst, was man ebenfalls als Unterhaltung, wenn auch als intellektuelle Unterhaltung beschreiben kann – obwohl ich mir sicher bin, dass alle hier Anwesenden es als Kunstwerk ansehen – wo bleibt da die Tötung der Juden?Wie ich hoffe, und glaube, dass dies aus meinem Artikel in der FAZ und aus meinem Buch ‘Die Thyssen-Dynastie’ hervorgeht, erachte ich diese als ein Verbrechen gegen die Menschlichkeit. Und keinerlei Ausmass an Kunst-Sponsoring, intellektuellen Nebelwänden oder akademischen Verleugnungen wird jemals etwas daran ändern’. The Budapest Szalon at Symbol on 25 March 2009. 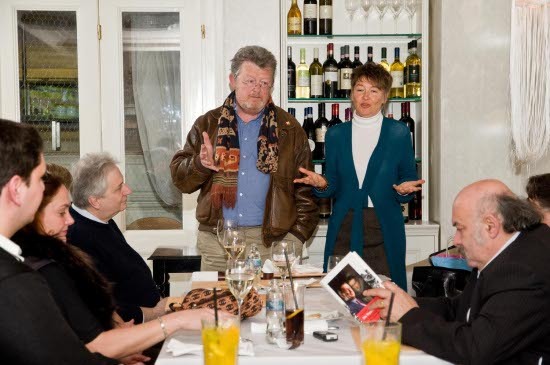 From left to right: Gabor Kasa Hunyadi (Adam Batthyany's adjutant), Margit Batthyany-Schmidt, Stephen Elekes (journalist), David Litchfield, Eniko Tegyi (the best simultaneous translator in the whole of the western world) and Tamas Suchman (politician). 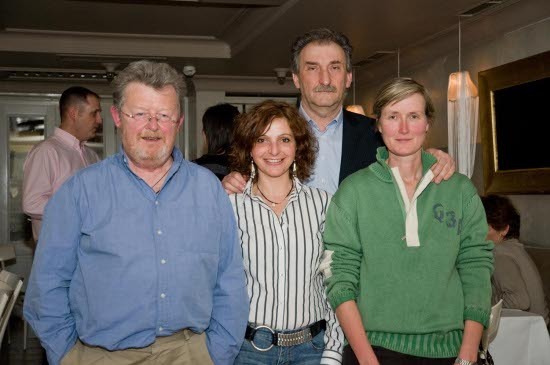 Fourth from left: Eva Kertesz (organiser of the Budapest Szalon); Fourth from right: Istvan Teplan (academic and co-founder, with George Soros, of the Central European University); Second from right: Istvan Hotto (Secretary of the Speaker of the Hungarian Parliament). Sandor Barna, owner of the Symbol and host of the Budapest Szalon, with Eva Kertesz, the author and his collaborator, Caroline Schmitz. One of my earliest literary memories is listening to a live recording of Dylan Thomas’s ‘Visit to America’ and his recollections concerning a ‘blue rinsed’ literary hostess mistaking him for one of his fellow authors, who she would obviously have preferred to have been welcoming. In my case, I had only been in Budapest for a matter of moments, before Eva Kertesz, the organiser of the charismatic Sandor Barna’s reintroduction of the traditional ‘salon’, informed me that I was her second choice. Apparently, she would have preferred to have been welcoming Elfriede Jelinek, but Elfriede doesn’t do personal appearances; even for the Nobel Prize committee. There had also been some disagreement concerning the proposed staging of her play ‘Rechnitz (still known here by its Hungarian name Rohonc) – The Exterminating Angel’. I was then informed that the ‘Arch Duchess’ Francesca Habsburg, nee Thyssen, had been invited but failed to even honour the salon with the courtesy of a reply, which I thought was rather ungrateful, considering the debt of gratitude the Thyssens owe Hungary for the part the country played in safeguarding their fortune. Perhaps she was intimidated by the thought of being obliged to attend my first engagement, where I shared the stage with the distinguished writer Laszlo Marton and the ambitious sociologist Eva Kovacs, taking part in a discussion before an invited audience at the Ratkai Marton writers’ club, where almost the entire audience was Jewish. Understandably, they wanted to talk of little else apart from the Rechnitz/Rohonc atrocity at which some two hundred Hungarian Jews were murdered in 1945 (including the father and uncle of the attending Gabor Vadasz) and in which the Thyssen family were physically, financially and morally implicated. Francesca may have felt more secure at the ‘salon’, which took place at Sandor Barna’s breathtaking, apparently recession-proof Symbol restaurant, where amongst the gathering of the city’s great and the good was the extremely attractive Margit Batthyany-Schmidt, of the same Batthyany family who ‘gave’ the Killer Countess her title and which has often been wrongly accused of owning the Thyssens’ Rechnitz/Rohonc castle, where the atrocity took place. 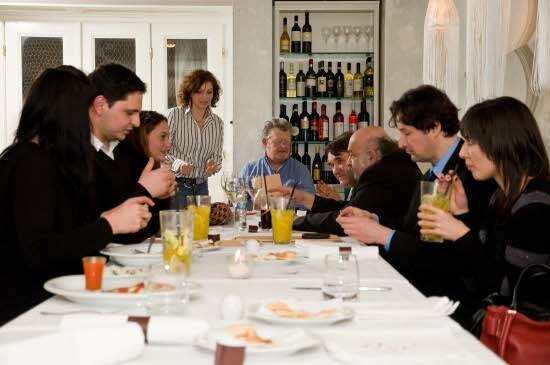 It was a far more congenial evening than the main subject of conversation deserved, despite the presence of a number of politicians and Mrs Zsuzsa Gyimesi’s apparent piggy fit. We look forward to returning to Budapest for the signing of a publishing contract and to meet once again with the divine Ms Agnes Böhm of Nepszabadsag newspaper, the dramatist Zsuza Radnoti of Vigszinhaz Theater, the filmmaker Sylvester Pecoky and the writer Laszlo Bito. 29.10.2008: Reading at Buchkontext in Essen, Germany. 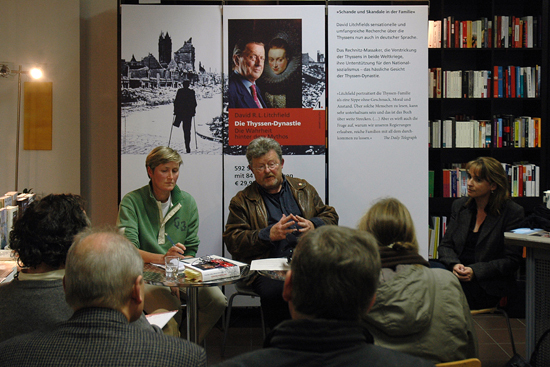 16.10.2008: Symposium concerning the Rechnitz massacre at the Landesmuseum Burgenland in Eisenstadt, Austria. 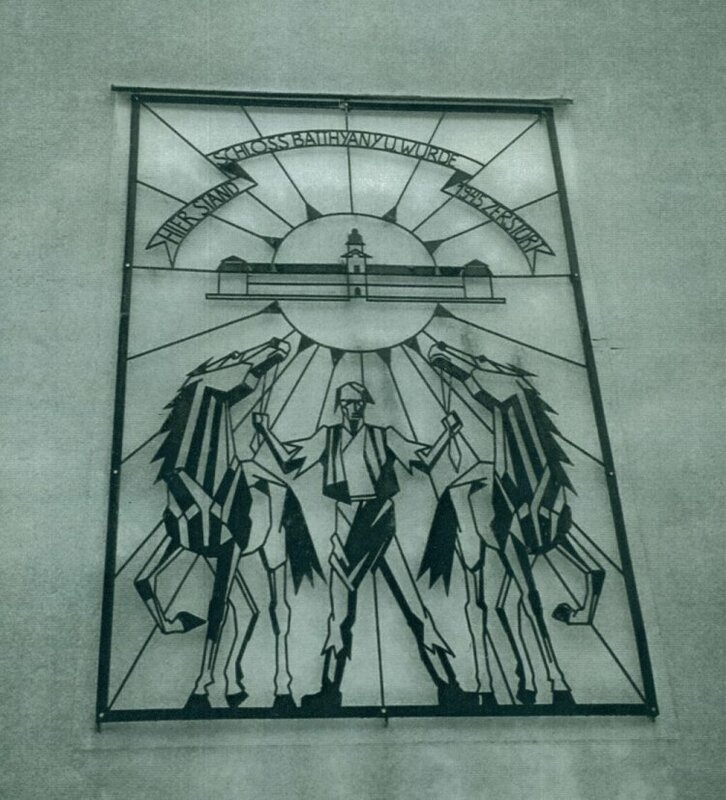 ‘Das Drama Südostwallbau am Beispiel Rechnitz. Taten, Daten, Fakten, Folgen’. (‘The dramatic events surrounding the building of the south-eastern fortifications demonstrated using the example of Rechnitz. Deeds, dates, facts, consequences’). 15.-19.10.2008: Frankfurt Book Fair (Frankfurter Buchmesse), Germany. Isabelle Menke in the Zurich Schauspielhaus production of 'Rechnitz'.